Japan is a nation of mountains formed at the point where two plates converge, so it is only natural that many Japanese love mountain climbing and hiking. Perhaps especially contributing to the boom in hiking fever here in Japan was the book One Hundred Famous Mountains of Japan by Kyuya Fukada. Mt. Amakazariyama is one of these mountains. Mt. Amakazariyama, 1,963m high, was formed during the Pleistocene epoch (less than 2.6 million years ago). It is an intrusion, meaning it was formed deep under the surface by magma forcing its way into cracks, pushing other rock out of the way. This mass of magma eventually cooled and was pushed above the surface. It is primarily made up of porphyrite, but it also contains significant amounts of basalt and rhyolite. With a wide, gentle slope and two distinctive ear-shaped peaks, easily recognizable from a distance, it has long served as a landmark for sailing fishing vessels. In his book, Fukuda describes this mountain differently than he does the others, calling it, "the mountain people yearn for," attracting countless visitors to this beautiful peak. Departing from Amakazari Hot Springs, the trail leading up this mountain offers a magnificent view of the Fossa Magna region, the Hida Mountains, and the majestic Ushiro-Tateyama ranges of the Japanese Alps, just across the Itoigawa-Shizuoka Tectonic Line. At this geosite you can relax at a simple, peaceful hot spring bath while taking in gorgeous mountain scenery. At a little less than 2000m, Mt. 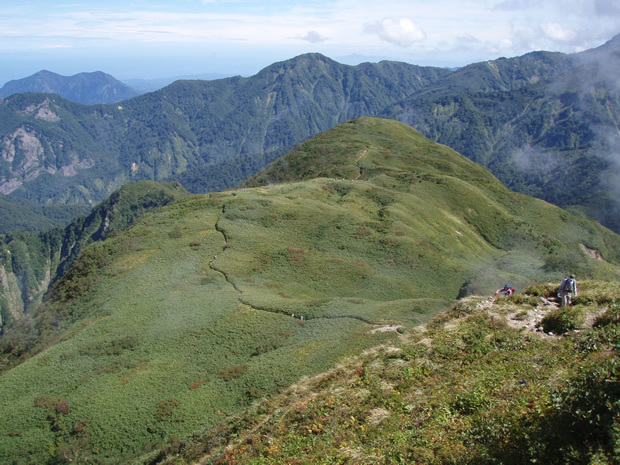 Amakazariyama is not a particularly high mountain, but it is steep and provides quite a challenge even to seasoned climbers. From Amakazari Lodge, it is about four hours to the peak. A strikingly beautiful mountain, it is well-loved by climbers far and wide. The view from the top is outstanding, offering views of Mt. Yakeyama, an active volcano, to the east and the Northern Alps spreading out to the west. To the north is a fantastic panorama of the Sea of Japan. Atop the peak are a number of stone shrines and Buddhist statues which were carried here in the 1800s by a local priest. They face the Sea of Japan, watching over the people of Itoigawa below. Before the final ascent to the peak, a large meadow of kumazasa spreads gently toward the summit. Kumazasa, or 'bear bamboo,' is a squat, broad-leafed bamboo species which grows in mountainous regions. It's striped foliage makes it a particularly attractive cover. The climbing route from Amakazari Lodge joins with other climbing routes here in this beautiful meadow where climbers can enjoy clear views and unspoilt scenery as they make their way to the top. Located at an elevation of 900m in the Amakazariyama Foothills, Amakazari Lodge is popular not only as a basecamp for climbing, but also for its beautiful, secluded hot spring baths. Multiple climbing trails start here, including the Amakazari Route which climbs Mt. Amakazari and the Umidani Mountains Route which climbs along the Umidani Mountain Ridge and ends at the peak of Mt. Komagatake. The hot spring baths of this secluded lodge, heated by magma deep underground, have been called "miyako wasure no yu," which means "the waters where you can escape the city." Surrounded by mountains and forest, it is easy to forget modern urban life in this distant oasis.